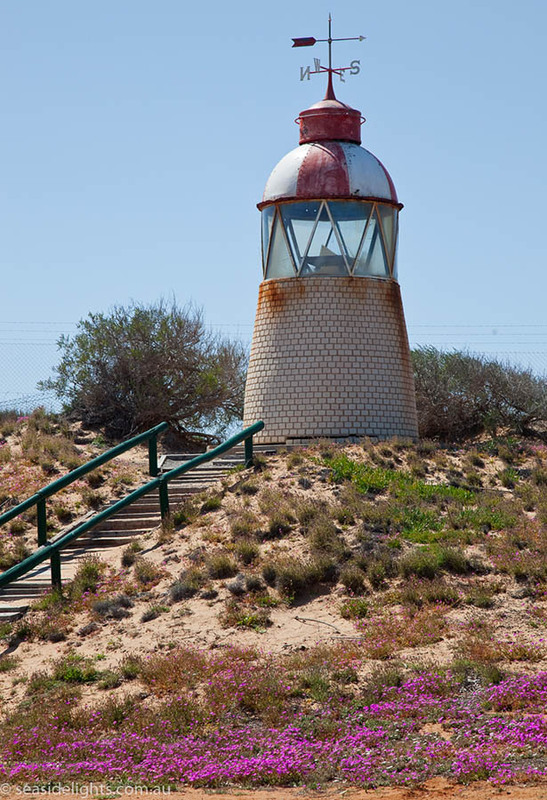 Babbage Island Lighthouse | Lighthouses of Australia Inc.
A wooden tower 60 feet high on a site 42 feet above sea level, held a fourth order dioptric light visible at 15 miles in good conditions. It was developed by the Northwest Branch of the Public Works Department with the lantern house and light supplied by the firm of W.T. Douglas. It was converted from paraffin (kerosene) oil to acetylene illumination in 1909, and it carried in 1913, two red sector lights flashing every 3 seconds, one visible on a bearing 015-041o which led west of Blowfish Bank, and a second visible one a bearing 345-031o which led west of Elbow Shoal. 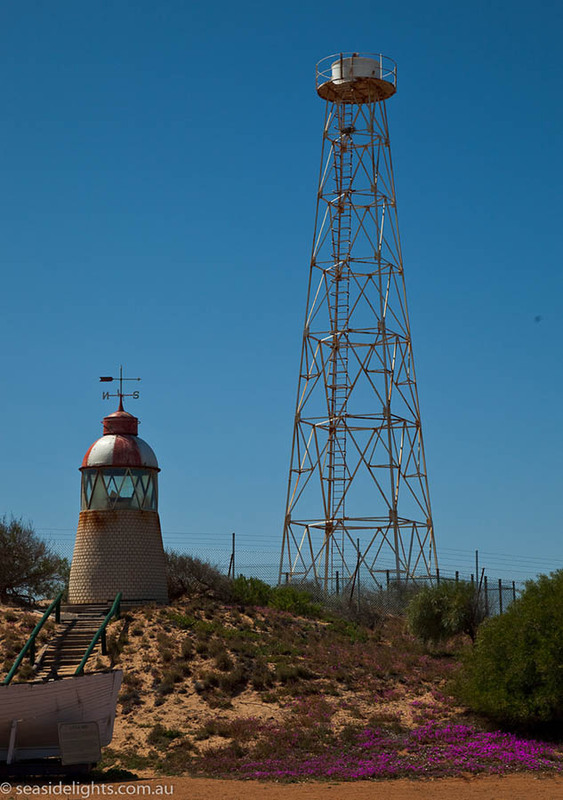 This light tower was described in 1922 and in 1948 as a white square (wooden) framework tower 18m high, supported a sectored flashing light at an elevation of 31m. This was replaced by a new light on a steel framework tower in the early 1960s, which was present and working in 1994. The original light is now on exhibition in the grounds of the Lighthouse Keeper’s cottage museum. The original 1896 wooden tower was damaged by fire and was replaced by the present steel skeletal tower in 1962. The lantern in now on display on the grounds near the tower. Location Lat: 24 deg. 52 min. 21 sec. S.
Long: 113 deg. 38 min. 08 sec. E.
On the summit on the Western side of Babbage Island at the entrance to the Gascoyne River. Elevation Focal plane: 101 ft. 6 inches above high water. Tours of the lighthouse grounds are available.